Movies are obviously a product of the time they were made and our connection to them is often a product of where and when we saw them just as much as the actual movie itself. 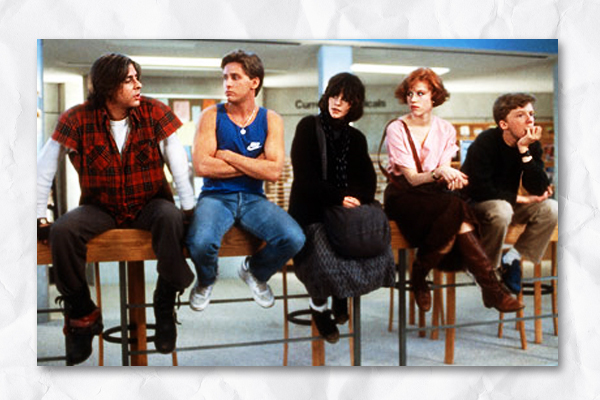 While I believe a lot of what made ‘TBC’ tap into teen consciousness is still very relative today – the needing to connect – the realization that the jock is not so different from the nerd is not so different from the basket case is not so different from the princess, etc. But I wonder how the Tomatometer would read on a movie like ‘TBC’, the ‘definitive 80s movie’, were it released today. (Out of curiousity, I checked with Rotten Tomatoes and ‘TBC’ stands at a healthy 90% fresh rating, but that is buffered by plenty of latter-day reviews.) And I ask that knowing how TBC’s ability to tap into teenage angst and its breakdown of high school stereotypes has been able to transcend the generational divide and captivate people to this day. The funny thing is, I first saw ‘TBC’ in 1986 when I was about 14, and I kinda got it, but the real reason I took to the movie was of who introduced me to it – my female cousins and the older sisters of my neighborhood friends. It felt like the older kids were letting me into their secret club and that was pretty damn cool. It was on later viewings as I careened through my own high school experiences that I took to it on a deeper level. But at 14, sitting in my friend John DePasquale’s living room as his sister flipped HBO on the television and we began watching with a bunch of her friends, that to me was an event. Does it still happen this way? Are people seeing movies like ‘Mean Girls’ or even ‘Harry Potter’ or ‘Twilight’ and experiencing a Hughes-i-fication that will keep those movies treasures in someone’s mind for the rest of their life? What movies did it for you? Greatest movie ever? It is when you're 14! To bolster my case, I present to you the 1985 gem ‘Just One of the Guys’. I saw this for the first time on HBO during a sleepover at my cousin Marc’s in Wantagh, NY. It tells the story of Terri, a high school girl who feels she got passed over for a journalism internship because she’s female. She embraces the only sensible option available to her: she dresses as a boy to prove everyone wrong! Hilarity ensues.The movie is part of the Billy Zabka trilogy (along with ‘The Karate Kid’ and ‘Back To School’) and in its iconic ‘reveal’ scene, is also quite possibly my first encounter with on-screen breasts. It is because of these facts that I defend it as one of the greatest movies ever made. There is a book out now by Susannah Gora entitled “You Couldn’t Ignore Me If You Tried” which the AP calls ‘a must-have for 80s Teen Flicks’. I haven’t read it yet, but based on some reviews I’ve seen, it’s worth a look. The author apparently talked with over 100 principal players in researching the book, so it is chock full of interesting anecdotes.